Maple syrup and honey producers aren&apos;t too sweet on a plan to label their natural products as containing added sugars. Every spring, Roger Brown treks into the cold Vermont woods to coax sap from thousands of maple trees, and then spends long days and nights boiling it, adding nothing but his own hard work to make the sweet essence of the northern forest. The thousands of gallons of maple syrup that Brown, his brother, and two cousins at Slopeside Syrup in Richmond produce each year, he believes, is sugar in its purest, tastiest form — a natural alternative to the artificial sweeteners that have made modern diets so unhealthy. Those two little words — added sugars — have set off a raging argument between the FDA and boutique producers of maple syrup and honey over the meaning of what would seem to be a simple phrase. The battle dates back to 2014, when the FDA began requiring nutrition labels to disclose the amount of “added sugars” in a serving of packaged food as part of a broad campaign to promote healthier eating. In its rule-making, the FDA leaned on definitions from the World Health Organization and US Dietary Guidelines that “sugars naturally present in honey, syrups, and fruit juices” are so-called free, or added, sugars. That effort to placate has only invited a new round of ridicule from honey and maple syrup producers, who see the FDA effort as the epitome of Washington bureaucrats run amok. Comments on the FDA’s footnote proposal are due June 15, but the agency has not said when it will make a final decision. The new labeling requirements are scheduled to go into effect in stages: by 2020 for food makers with annual sales of $10 million or more, and by 2021 for smaller companies. 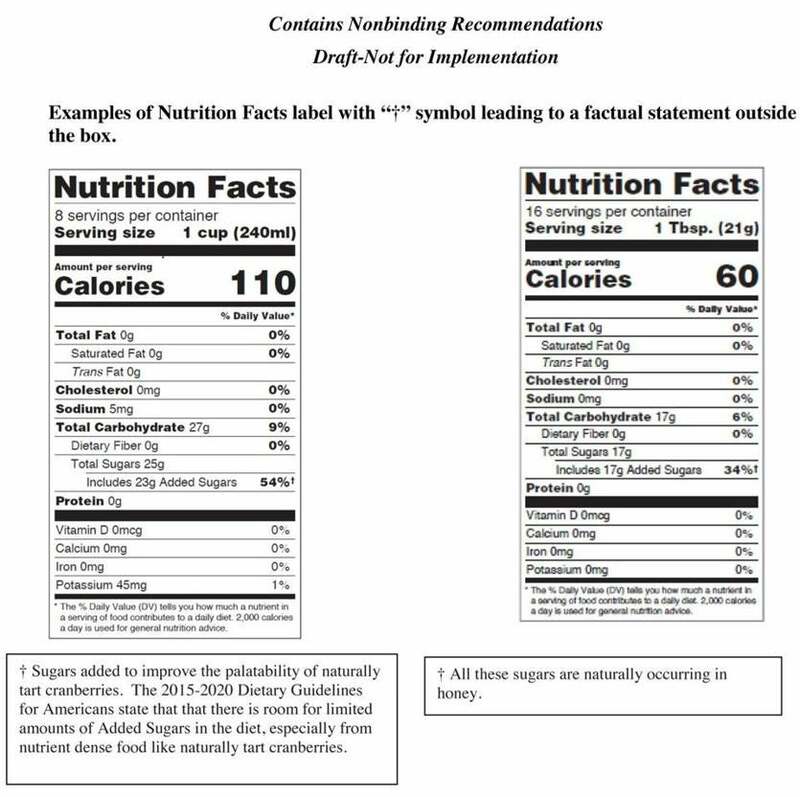 The FDA declined to provide officials for interviews, pointing instead to information it released during the rule-making that includes making a distinction between foods that are rich in nutrients, and those full of empty calories. Suggested label from the Food and Drug Administration. That very explanation triggered a different argument from producers of another iconic New England product: cranberries. Here, the issue isn’t semantics; cranberry producers such as Ocean Spray openly acknowledge they add sugars to their juices and other products. Otherwise, consumers might not buy them because the tart, acidic berry in its natural form is unpalatable to most people. Instead, Ocean Spray said its products meet another FDA criterion: They are rich in important nutrients, so an “added sugars” line could dissuade consumers from buying a product the company argues is good for them. “Because consumers have been led to believe that ‘added sugar’ signifies that a product is unhealthy, the Proposed Rule will mislead them to think that the cranberry product is a less nutritious choice than a product made from another fruit, even those with more total sugar,” Ocean Spray wrote in its original objection to the FDA language in 2014. Ocean Spray also wants the FDA to carry through on a promise to mount an educational campaign for consumers. “We feel that it’s important to make sure consumers understand that there is a full picture here and that we don’t just get tarred with added sugar,” said Kellyanne Dignan, director of global corporate communications at Ocean Spray. Sean Cash, a nutrition economist at Tufts University, said the general idea behind the FDA proposal is to give consumers a way of seeing “unnecessary” sugars in their foods. 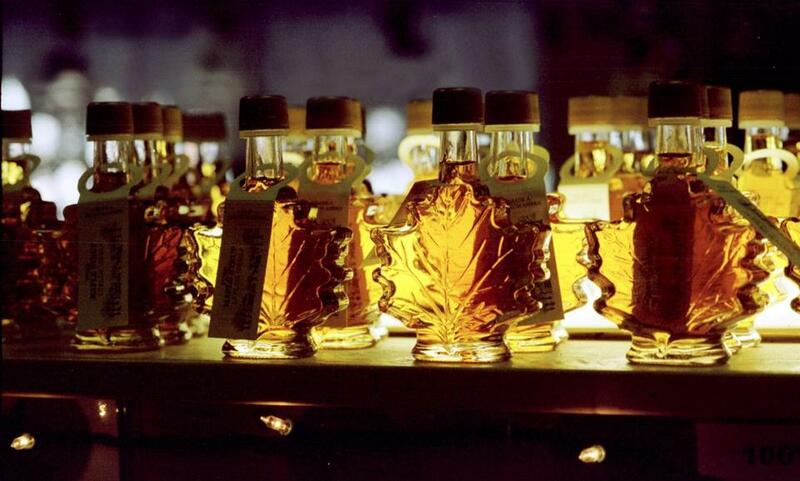 Cash said it is understandable why maple syrup and honey producers would be upset; the FDA wording implies their naturally pure products have been adulterated. But from a dietary perspective, he said, the FDA’s argument also makes sense. Alex Gailey can be reached at alexandra.gailey@globe.com.